Isotron® IEPE-type voltage mode accelerometers features an integral electronic impedance converter eliminating the need for an external charge amplifier. An IEPE accelerometer has a fixed amplitude range. A typical charge-mode accelerometer will have an operating temperature range of –55°C to 288°C. Special-purpose accelerometers are available for extreme environments as low as –269°C to as high as 760°C. Special radiation-hardened charge-mode accelerometers are available for use in a nuclear environment. For low-level shock measurements, a general-purpose accelerometer will usually do the job. The accelerometer will need a linear range of at least 500 g and a shock survivability rating of 500 g. An IEPE type is usually preferred because they are less susceptible to producing erroneous. 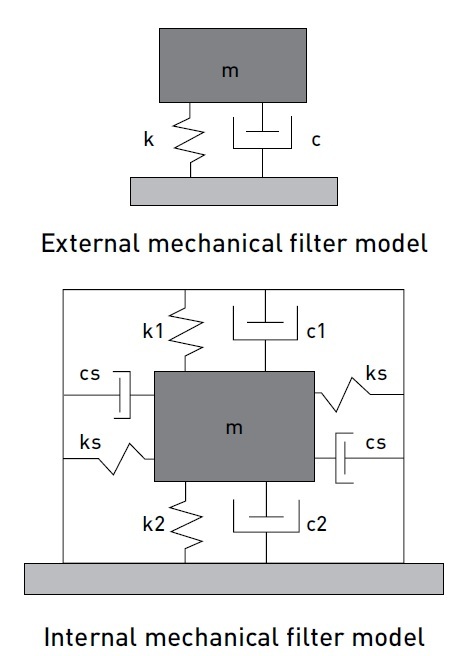 For far-field shock measurements, a special shear-mode accelerometer with a built-in electronic filter is often adequate. These are usually lightweight IEPE types with solder connections. The electronic filter attenuates the resonance frequency of the accelerometer to prevent overloading of the DA equipment. IEPE accelerometers can drive long cables with minimal distortion and noise pick-up. Isotron® electronics are compatible with industry standard IEPE current sources built into most industry standard data acquisition systems. 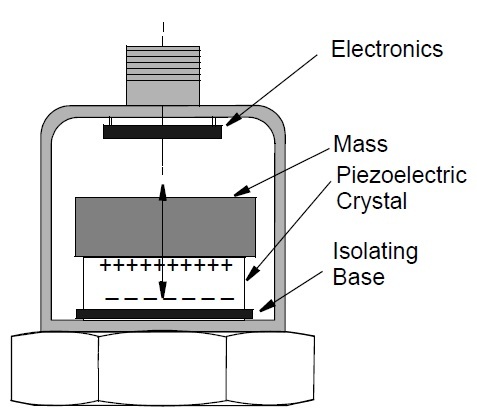 The sensing element of Piezoelectric accelerometers is a piezoelectric material that can be either natural quartz crystals or man-made polycrystalline ceramics. The basic principle of Piezoelectric Effect is an inherent or induced property of these crystals. As the crystal undergoes stress due to applied force during acceleration, negative and positive ions will accumulate onto the opposed surfaces of the crystal. 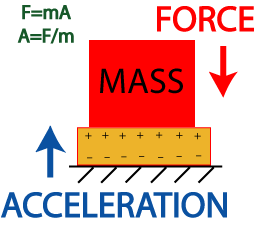 The amount of accumulated charge is directly proportional to the applied force when the applied acceleration can be calculated according to Newtons’ law of motion F=mA. 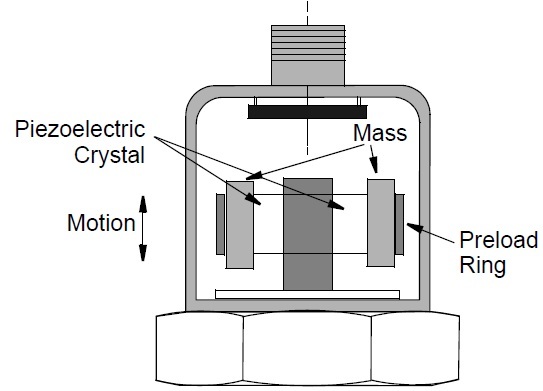 A proof mass is bonded to the crystal and an electrical charge is generated when a force is imposed upon the crystal during acceleration and this output is relative to the applied force. The piezoelectric element is connected to the Sensor output via a pair of electrodes. The sensing element is housed in a suitable sensor body to withstand the environmental conditions of the particular application. One side of the piezoelectric material is connected to a rigid post at the sensor base. A seismic mass is attached to the other side. Due to the piezoelectric effect a charge output proportional to the applied force is generated and the charge output signal is proportional to the acceleration of the mass. Over a wide frequency range both sensor base and seismic mass have the same acceleration magnitude so that the sensor measures the acceleration of the testing object.Piezoelectric accelerometers cannot measure constant acceleration because they are inherently AC coupled, however, they are typically the most versatile and economic choice for measuring fast transient and periodic acceleration wherever shock or vibration is of interests. Please complete the enquiry form below for specific information and advice on Isotron/ IEPE.